Paragon International School strives to advance the academic performance of students and enable them to reach their full potential. 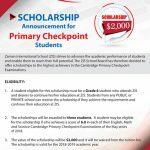 The Paragon ISC school board has therefore decided to offer scholarships to the highest achievers in the Cambridge Primary Checkpoint Examinations. A student eligible for this scholarship must be a Grade 6 student who attends Paragon ISC and desires to continue his/her education at Paragon ISC . Students from any PUBLIC or PRIVATE school can receive the scholarship if they achieve the requirements and continue their education at Paragon ISC . The scholarships will be awarded to three students. 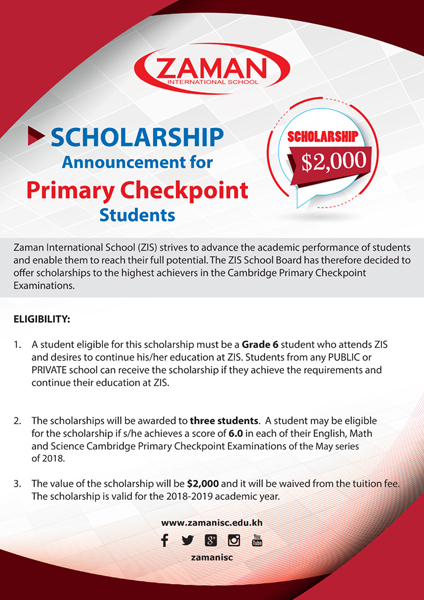 A student may be eligible for the scholarship if she/he achieves a score of 6.0 in each of their English, Math and science Cambridge Primary Checkpoint Examinations of the May series of 2018. The value of the scholarship will be $2,000 and it will be waived from the tuition fee. The scholarship is valid for the 2018-2019 academic year. Paragon International School strives to advance the academic performance of students and enable them to reach their full potential. 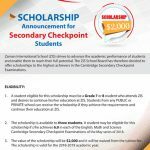 The Paragon ISC school board has therefore decided to offer scholarships to the highest achievers in the Cambridge Secondary Checkpoint Examinations. 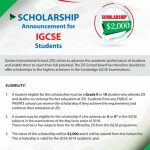 A student eligible for this scholarship must be a Grade 7 or 8 student who attends Paragon ISC and desires to continue his/her education at Paragon ISC. Students from any PUBLIC or PRIVATE school can receive the scholarship if they achieve the requirements and continue their education at Paragon ISC . The scholarship is available to three students. 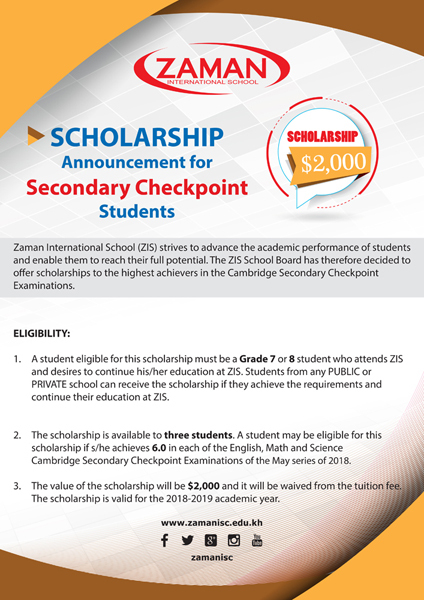 A student may be eligible for this scholarship if she/he achieves 6.0 in each of the English, Math and Science Cambridge Secondary Checkpoint Examinations of the May series of 2018. The value of the scholarship will be $2,000 and it will be waived form the tuition fee. The scholarship is valid for the 2018-2019 academic year. Paragon International School strives to advance the academic performance of students and enable them to reach their full potential. The Paragon ISC school board has therefore decided to offer scholarships to the highest achievers in the Cambridge IGCSE Examinations. A student eligible for this scholarship must be a Grade9 or 10 student who attends Paragon ISC and desires to continue his/her education at Paragon ISC. Students from any PUBLIC or PRIVATE school can receive the scholarship if they achieve the requirements and continue their education at Paragon ISC . 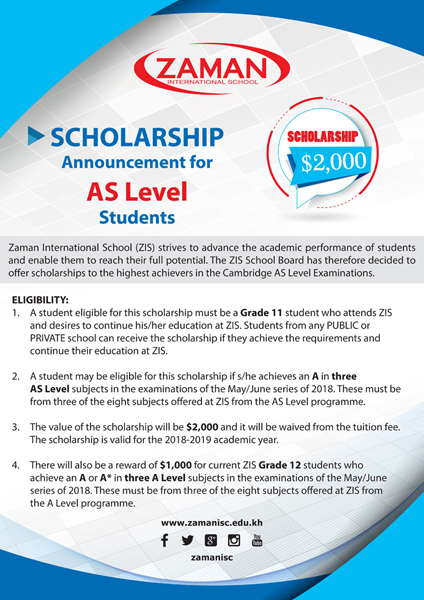 A student may be eligible for this scholarship if she/he achieves an A or A* in five IGCSE subjects in the examinations of the May/June series of 2018. These must be in five subjects from the 16 offered by Paragon ISC from the IGCSE programme. Paragon International School strived to advance the academic performance of students and enable them to reach their full potential. The Paragon ISC school board has therefore decided to offer scholarships to the highest achievers in the Cambridge as Level Examinations. A student eligible for this scholarship must be a Grade 11 student who attends Paragon ISC and desires to continue his/her education at Paragon ISC. Students from any PUBLIC or PRIVATE school can receive the scholarship if they achieve the requirements and continue their education at Paragon ISC. 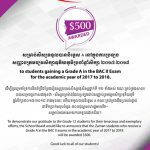 A student may be eligible for this scholarship if she/he achieves an A in three as Level subjects in the examinations of the May/June series of 2018. These must be from three of the eight subjects offered at Paragon ISC from the AS Level programme. The value of the scholarship will be $2, 000 and it will be waived from the tuition fee. The scholarship is valid for the 2018-2019 academic year. There will also be a reward of $1,000 for current Paragon ISC Grade 12 students who achieve an A or A* in three A Level subjects in the examinations of the May/June series of 2018. There must be from three of the eight subject offered at Paragon ISC from the A Level programme. 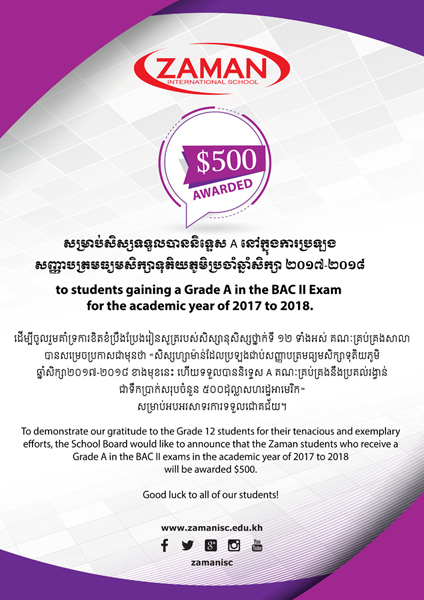 To demonstrate our gratitude to the Grade 12 students for their tenacious and exemplary efforts, the school board would like to announce that the Paragon students who receive a Grade A in the BAC II exams in the academic year of 2017 to 2018 will be awarded $500.